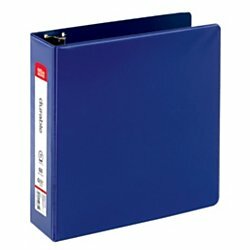 OfficeMax Durable Reference Binders with Round Ring 3'', Blue by OfficeMax at Transparent University. MPN: OM02830. Hurry! Limited time offer. Offer valid only while supplies last. Keeping the paperwork and documentation on your projects neatly stored and organized can help ensure youre able to find what you need more quickly.